Custom Exhaust & Brakes, Inc. offers friendly, reliable and affordable auto repairs to Asheville and the surrounding areas. 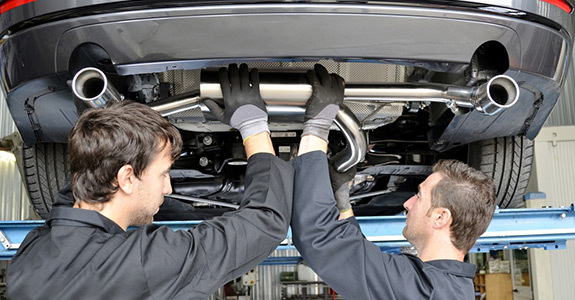 For over a decade, our ASE-certified team has provided a wide range of services, from exhaust and muffler repair to brake work. It doesn’t matter whether you own a brand new vehicle or are trying to squeeze a few thousand more miles out of an old clunker—when you’re a driver, you need a mechanic you can always count on for auto repair in Asheville, NC, whatever you need, and whenever you need it. Since 2004, countless area residents have turned to Custom Exhaust & Brakes, Inc. for the car care they need. Thanks to our combination of highly skilled, ASE-certified technicians, wide range of services and affordable prices, we’ve built a strong reputation for providing friendly, high quality auto repair service, and we look to keep building on that reputation for years to come. We provide high quality automotive repair services. We are a proud local business serving residents of Asheville, NC and the surrounding areas. We have ASE-certified technicians on our team, as well as an A+ rating from the BBB. Our offered services range from the very simple to the very complex. We offer dependable and friendly service for competitive prices.